Three years have come and gone in just the blink of an eye! 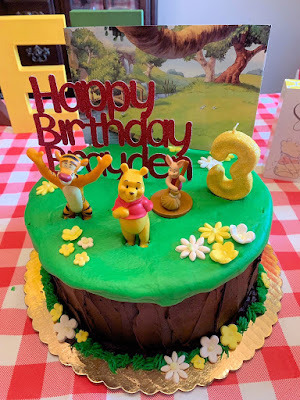 It seems like I just finished planning Brayden's Puppy Dog Pals themed 2nd birthday party when it was already time to begin thinking about his third! I've always loved Winnie the Pooh. If you asked me back in high school, I would have told you that Eeyore was my favorite Disney character. My husband also grew up loving Pooh (and his Pooh bear even made an appearance at Brayden's party so stay tuned)! 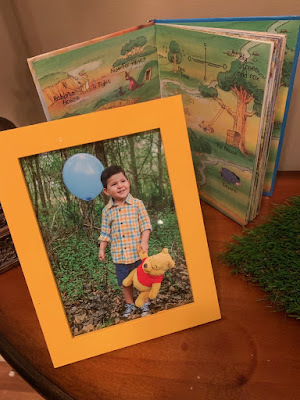 When Brayden was born, I knew I wanted to introduce him to the wonderful world of the Hundred Acre Wood and so I did! Every night before bed, he even wants me to "sing Winnie Pooh" meaning the Hundred Acre Wood song. 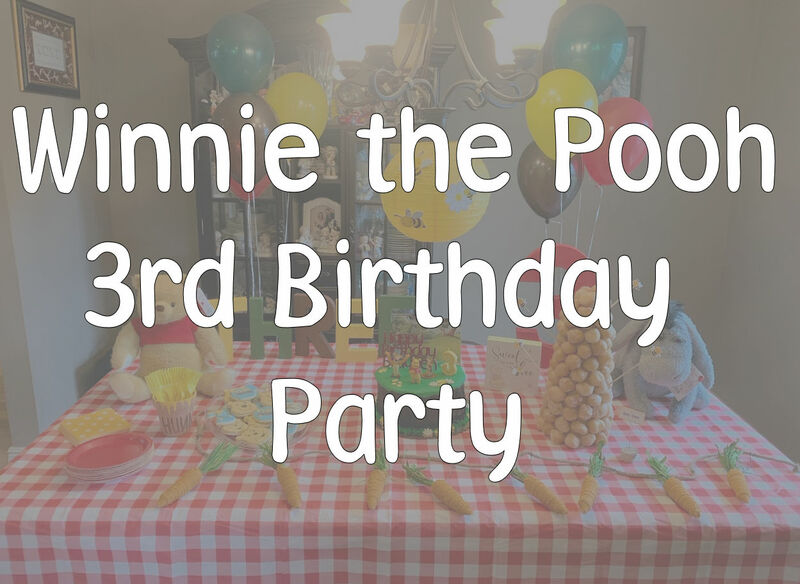 As his third birthday approached, I decided it was now or never for a Pooh themed party, so here it is! 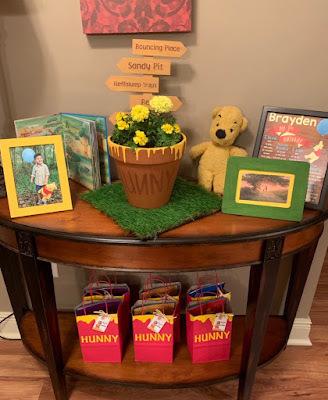 The theming for this party was not focused on classic or vintage Winnie the Pooh, but just Winnie the Pooh in general. I also added in lots of carrots and bees throughout the party! The colors I worked with were forest green, yellow, brown, and red. 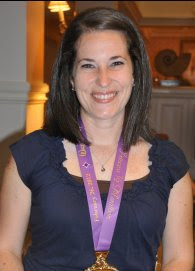 At the front door, guests were greeted with a "Welcome to the Hundred Acre Wood" sign. I found the pallet style wood piece at Walmart and glued dowel rods on the back with wood glue. I also painted the sign, then used my silhouette to make a stencil for the lettering. After the initial round of paint dried, I then used the stenciling to paint in the darker brown letters. On the day of the party, I tied a yellow and a red balloon to the sign and voila! 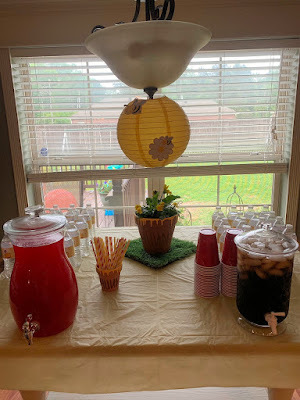 This added such a cute feature to the party! Our dining room table was also decked out for the party. This table is located very close to the front door, so it was one of the first things guests saw when entering the room. Here, you can see where I used some of the carrot/bee elements I mentioned earlier, as well as a good bit of the color scheme. 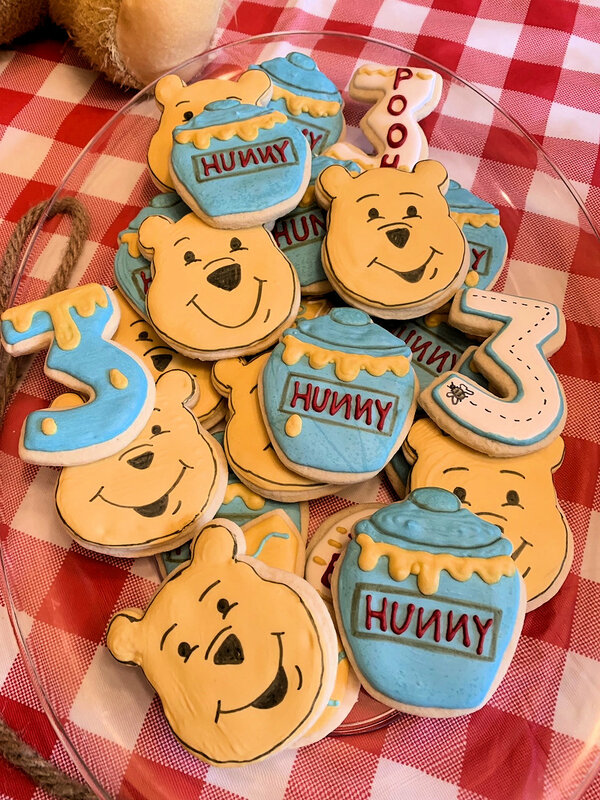 These adorable cookies were made by a friend of mine. Aren't they precious? One of my favorite parts of the party was his cake! The lady that made this cake also made the cake for the baby shower, his first, and second birthday parties as well! 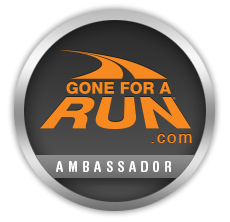 They taste so good and she does a great job! This time around, I basically asked her for a cake with a "stump", green grass, and flowers. I added the rest of the items on top. She did exactly what I asked and the cake turned out exactly like I was hoping it would! At the fireplace, I included a Happy 3rd Birthday, Brayden banner that I created using the Silhouette cameo and card stock. On the mantel itself were all four of the Christopher Robin 8" characters that were purchased from Amazon as well as a couple of photo frames with pictures from his 3 year old photo session. These are the same frames I've used from his parties every year, I just keep painting them to match the theme! At the entry way table were a few additional photo frames, a map of the hundred acre wood, a clay planter made to look like a hunny pot, Jason's Pooh bear from when he was a baby, and a "see how I've grown" photo that was purchased from an Etsy shop. 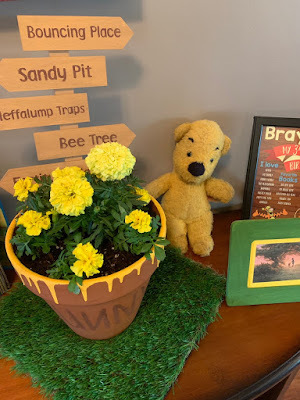 These clay planters made to look like hunny pots were SO easy, I couldn't believe it myself! 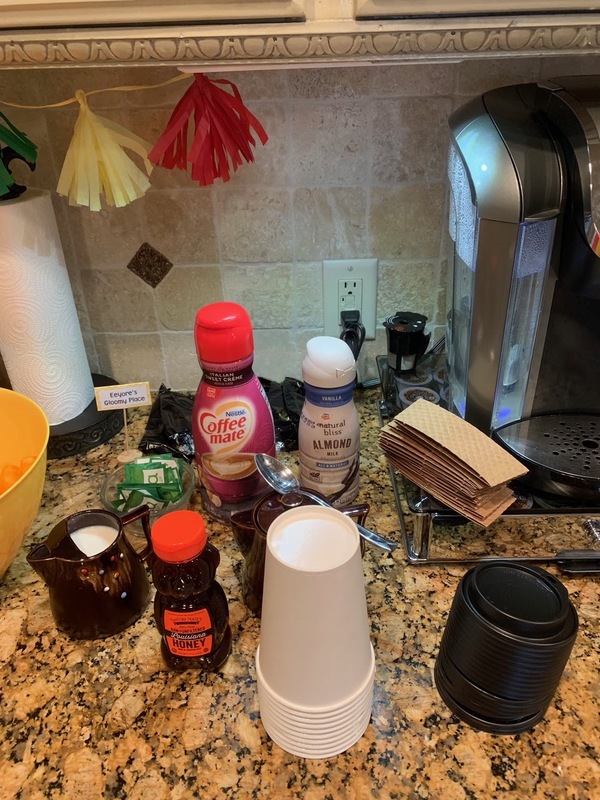 You basically take a bottle of yellow paint and squeeze it all the way around the rim, let the paint drip and dry, paint the word "Hunny" on the pot, and voila! I wasn't quite sure what to put in them once I was done, but I saw some online filled with yellow flowers, so that's what I went with! The sign inside of the pot was purchased on clearance at Hobby Lobby. I basically took landmarks from the map of the hundred acre wood and used the same technique to paint this one as the Hundred Acre Wood sign from the front porch. At the drink table, we had an option of water, red juice, or sweet tea. You can also see here how the yellow lantern was made to look like a bee hive, which made an adorable touch! 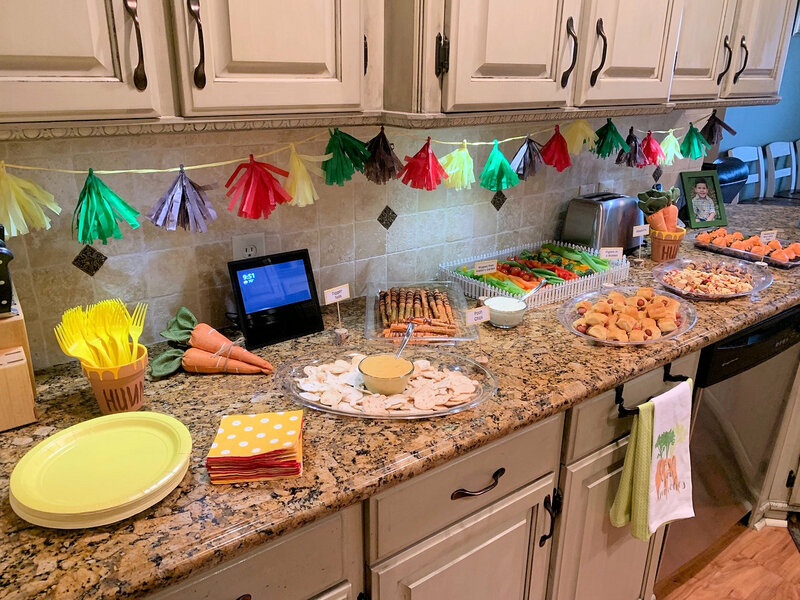 Another favorite party element of mine was the food spread. I had so much fun planning and creating these - it really was great to see it all come together! As you can see here, I also created a few smaller "honey pots" from the clay planters. 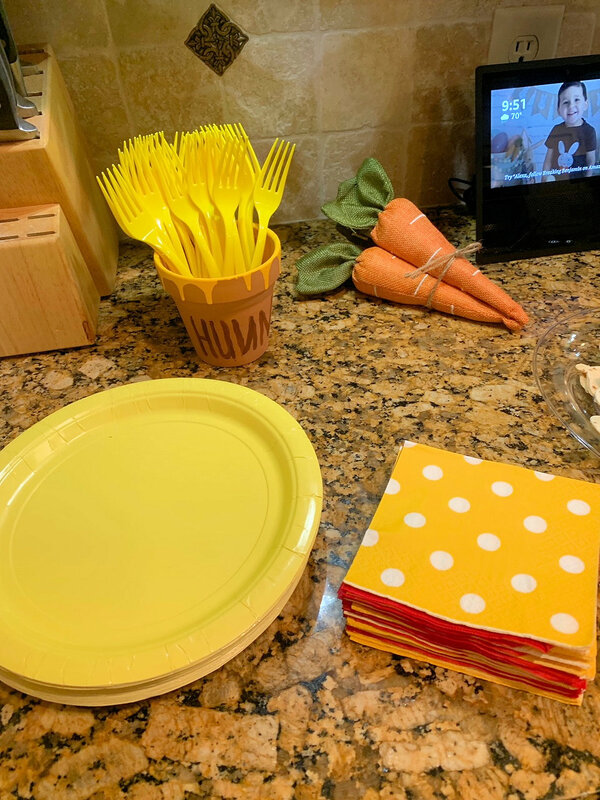 They were used for forks, straws, and one even held a bundle of carrots. 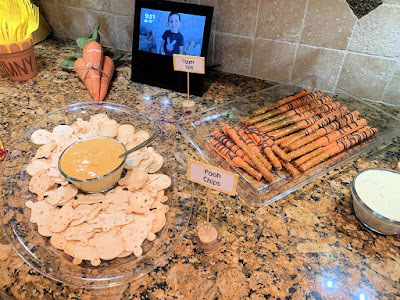 The carrots you see here were purchased from Target in the dollar section! To the right, you'll notice a "carrot patch" complete with "dirt". These were made out of strawberries with orange dipping candy and the the dirt was made out of the chocolate cookie part of the oreo that was pulverized in the food processor! Here, you see "tigger tails" which were basically large pretzel sticks dipped in orange melting candy and drizzled with chocolate. Also, I made my own "pooh chips" out of flour tortillas. The idea I read about online said to cut the pooh chips out with scissors but uhhhh...I ordered a pooh shaped cookie cutter from ebay instead. 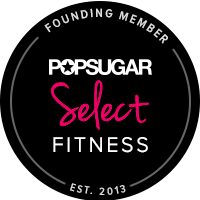 (Which I highly recommend because seriously, who has time for that?) 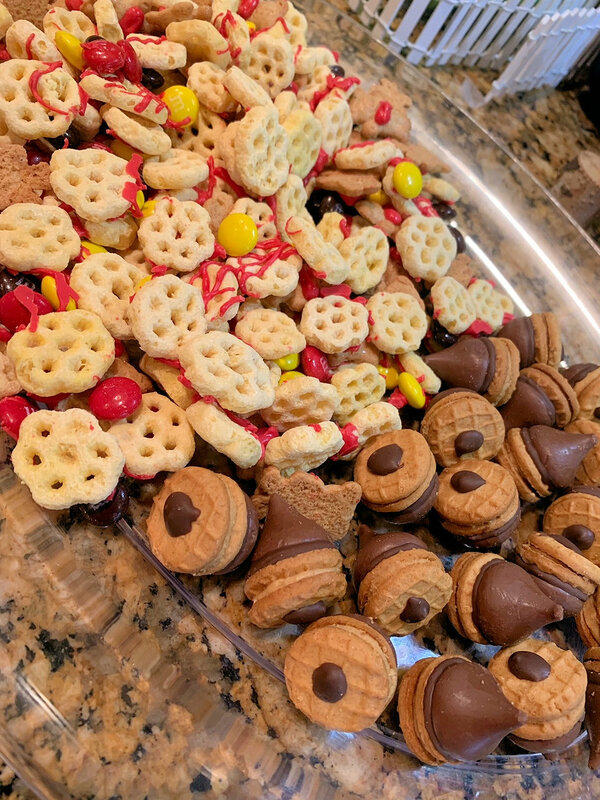 These were so cute and definitely a huge hit! 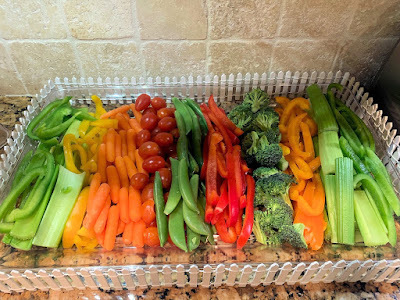 Rabbit's vegetable garden was another favorite party element of mine! I found this adorable white picket fence at Hobby Lobby in the little fairy garden section and it wrapped around my tray perfectly! 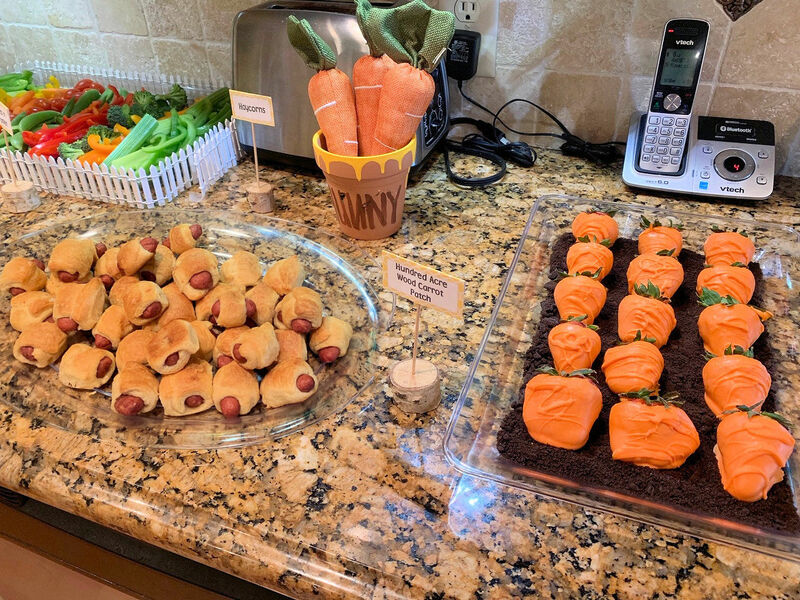 We also included a few extra "fun" food elements to the party. Here, you'll see "haycorns" which were basically little bite sized nutter butters with a hershey kiss attached. Also shown here is a honeycomb snack mix made with honeycomb cereal, M&M's (red, yellow, and brown), and teddy graham cookies (with a drizzle of red to make them look like pooh's shirt). After mixing the ingredients together, they were all laid out on parchment paper and drizzled with red melting candy! 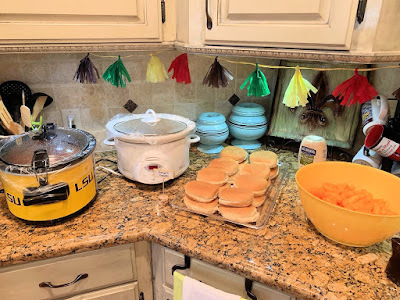 For "real" food, we had pulled pork (which my husband tried to call "shredded piglet"...again, sorry Piglet) and meatballs that were labeled "Kanga Kabobs". The tassel banner you see throughout was made by using a tutorial from YouTube. These were SO time consuming which I didn't expect! I'll definitely look into purchasing these next time around. 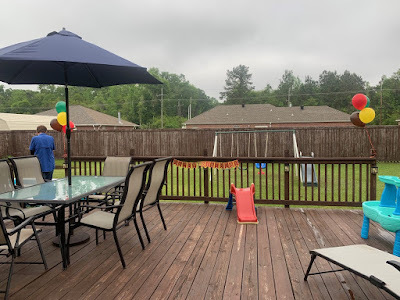 On the deck outside, I also placed some balloons as well as a happy birthday banner for a litle festive touch. 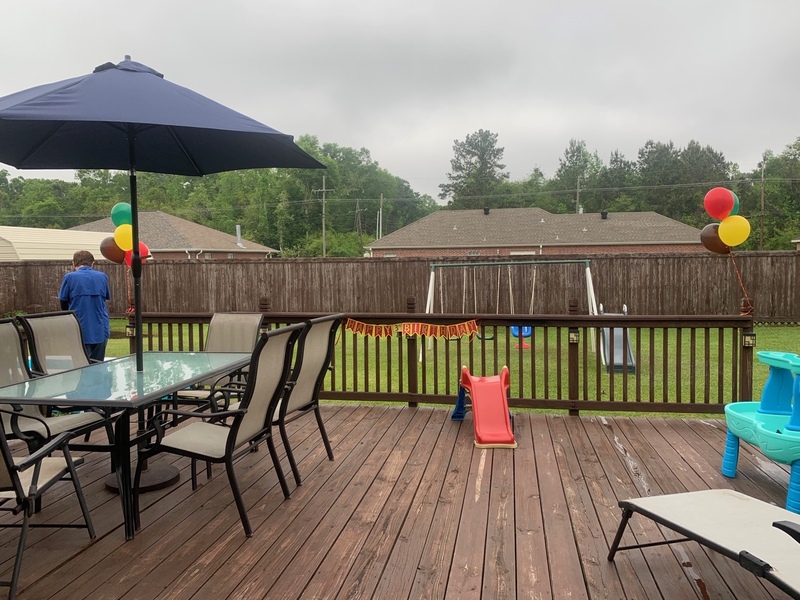 This party was intended to be a "water" party and although the weather wasn't perfect, it all still went as planned and Brayden had a blast! Brayden's great grandmother is so creative with her ideas and this is what she put on his present with the bow! Isn't it precious?! We started the party off by singing happy birthday to the birthday boy and opening presents because I knew once he got outside in the water, he wouldn't want to come back inside again! 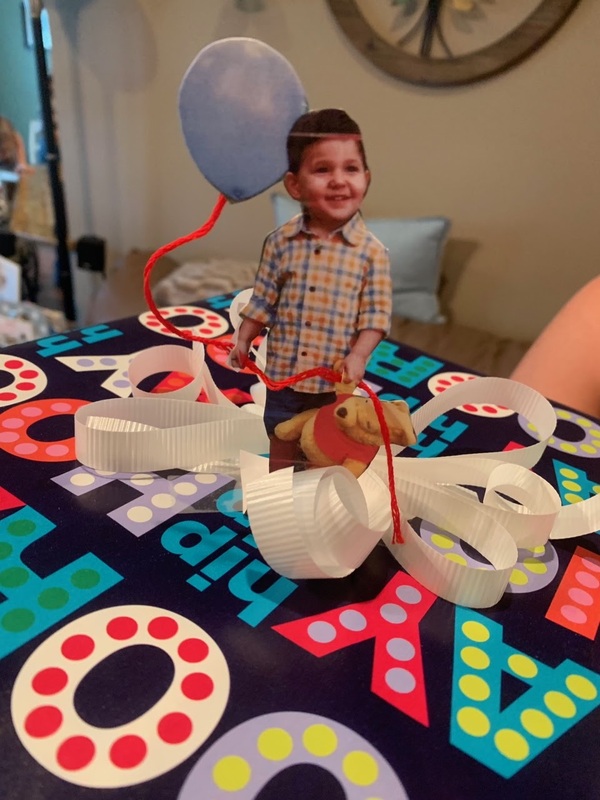 I included the photo of him opening the present so you can see the adorable Pooh birthday shirt a friend of mine made! For the swimming portion of his party, we changed him into his Pooh swim trunks which I miraculously found on Ebay a few weeks before the party. I randomly came across them one day and knew we had to have them for his party! 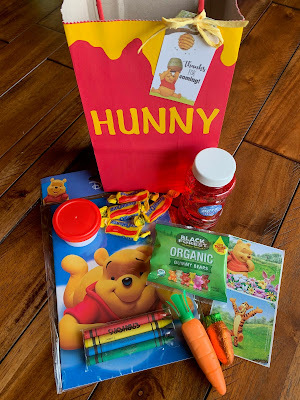 As far as favor bags go, I created these "Hunny" ones out of red gift bags from target and yellow vinyl which was cut from the Silhouette. Inside the bags were Pooh coloring books and crayon sets from Amazon, carrot candy from Target, Bit-O-Honey candy and gummy bears (also from Target), red bubbles from Walmart, and Pooh stickers from Etsy. 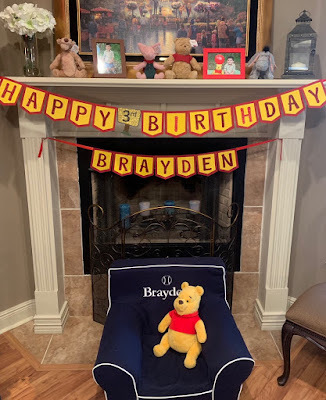 In all, Brayden had a fabulous time at his party and we loved celebrating the birthday boy with our family and friends! 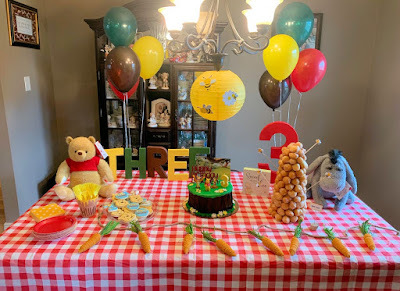 I hope this helped you and gave some ideas if you are in the process of planning a Pooh party for your little one! If you'd like to see a video recap of the party (as well as video footage of the party details), check out the video below! That was such a cute party! I loved doing birthday parties for my kids back when they were young - my go-to book (because no internet back then, CAN YOU IMAGINE) was the Penny Whistle Party Planner...it would be so fun now to do parties with so many more ideas circulating around! Braydon is such a cutie and looks very loved and happy. Good job, Mom and Dad! 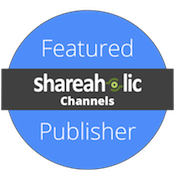 Thanks, Shelley! I totally remember the days with no internet! Hah! Pinterest also wasn't around when I was planning my wedding and I so wish it had been! 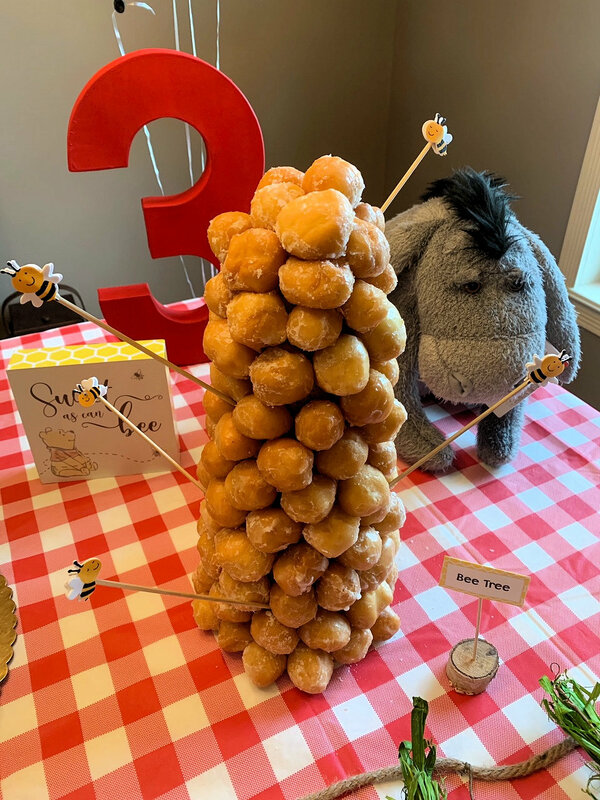 Wow, Brayden's Pooh Party looks amazing! You are so talented and creative and all of the work you put into this party really shows how much you love your little boy. I don't have kids of my own, but it's always fun for me to see how others use their creative talents. Glad he enjoyed his party!